As part of the Roman Catholic custom, the coming of the three wise men bearing gifts to the Christ child is celebrated in New Orleans each year on January 6th. Referred to as Twelfth Night, the Feast of the Epiphany, or Epiphany, this celebration marks the beginning of Carnival season. Over the next several weeks of merriment, anticipation builds until the season ends on Fat Tuesday, known in Louisiana as Mardi Gras, the day before Ash Wednesday. It is a time for feasting and gift giving before the fasting and religious observance of Lent. The culinary centerpiece of this season is the sharing of king cake. Believed to have originated nearly a thousand years ago in France, the cake is an homage to the wise men or the three kings. The cake is braided into a round shape, covered in icing, and sprinkled generously with sugar in the Mardi Gras colors of green, gold, and purple. Green represents faith, gold represents power, and purple represents justice. The cake’s circular shape resembles a king’s crown, but in New Orleans, the cake is typically oblong. Some say the cake is round to resemble the route the three kings took to Bethlehem. Many king cakes are flavored with cinnamon, while others have cream or fruit fillings. In Europe and beyond, a bean, pea, pecan, or coin is hidden inside the cake. In New Orleans, it is a plastic king cake baby which, as Mardi Gras historian Arthur Hardy notes, was introduced by McKenzie’s Bakery as a replacement for a more expensive porcelain doll. While some have claimed an association with the baby Jesus, it may be more representative of a New Year’s baby. The lucky person who finds the baby in their piece of king cake is unofficially crowned king or queen for the day, and is expected to host the next king cake party as a way of spreading good fortune and ensuring that the festivities continue throughout the Carnival season. At king cake parties, where favorite dishes such as red beans and rice are also served, you will hear locals ask, “Who got the baby in the king cake?” This question is the inspiration for my new book Who Got the Baby in the King Cake? 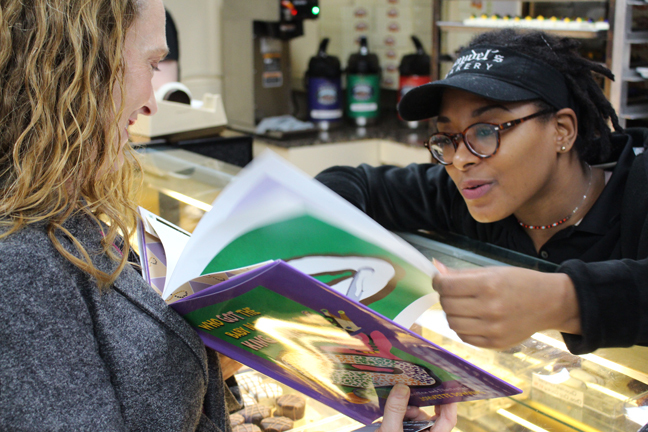 I bought my first king cake of the season at Haydel’s, and I could not resist sharing my new king cake book with them! Of course, I got the baby in the very first slice so I guess I need to buy the next cake and host the next party. Win-win! Who GOT the baby in the king cake? It just might be you!